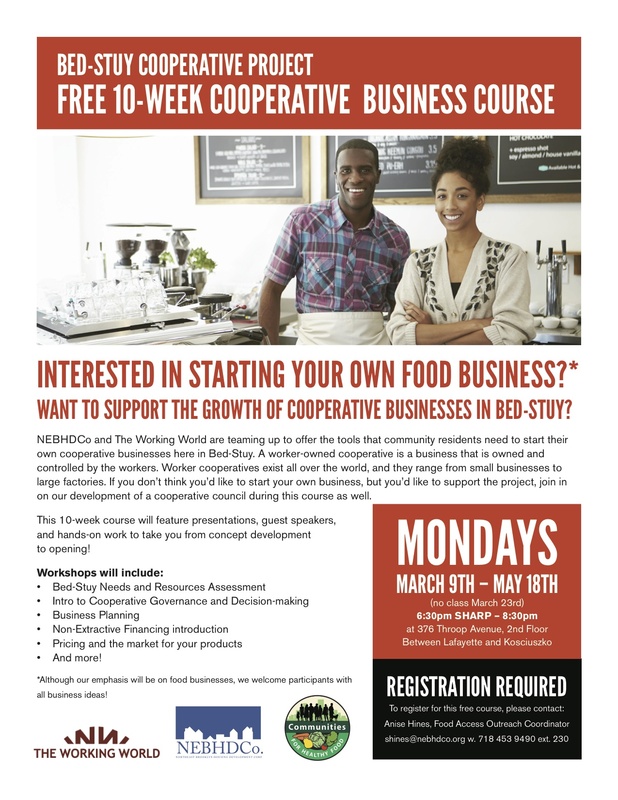 Interested in starting your own co-op in Bed Stuy? We recently partnered with NEBHDCo to start locally-owned worker-cooperatives in Bedford Stuyvesant. Through this 10-week course, residents will learn the basics of starting a worker-cooperative. Please invite local residents of Bed Stuy to participate in this course and business leaders to participate on the cooperative council! The Bed Stuy Cooperative Project is the second local incubation course The Working World has begun to offer since opening in New York three years ago. Just like our WORCs cooperative incubator in the Rockaways, establishing a local community of cooperative businesses will begin the process of creating ownership within the rapidly changing Bed Stuy community.